One question that is seen again and again in the news forums is “how to configure a custom message prior to running a software package”? In this post you can download a utility developed with help from Jakob G. Svendsen that can be used to customize a message that is shown prior to running the real software package. 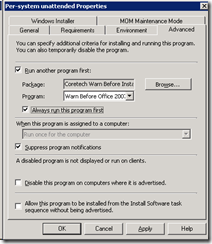 The utility – WarnBeforeInstall – is installed on each client. When you want to show a custom message you just call the program with a few parameters. The parameters control the title, the message and the countdown value. When the user clicks OK (or the countdown reaches 0) the program will finish with a success code and the parent software program will then automatically kick off. The logo in the box can be replaced just place a custom banner.jpg file in the program folder. First you create and deploy the WarnBeforeInstall utility to all clients. You cen deploy the package silently without any user intervention. Create a program in the package for each unique message you want to show. I have create a generic program and programs for each major deployment where specific messages are required. 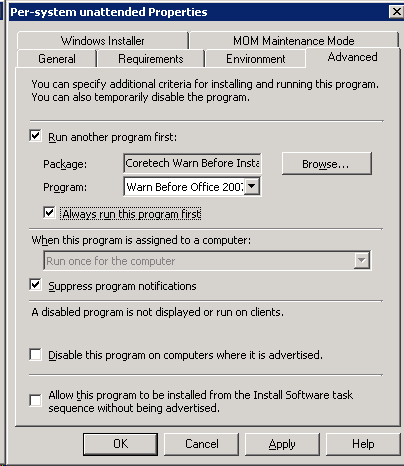 Specify the program to suppress program notification (otherwise the Config Mgr. balloon will be shown prior to running our warning. 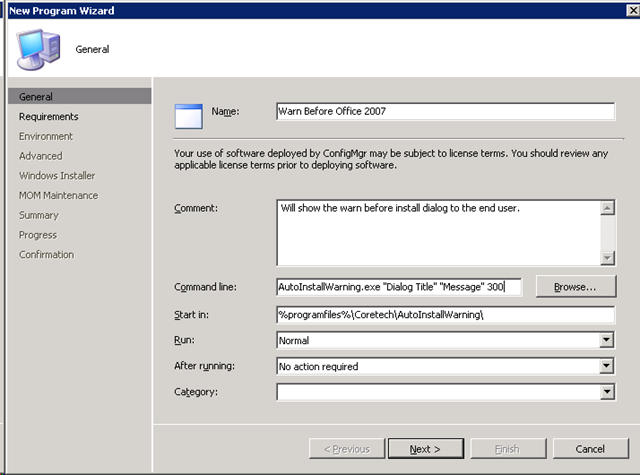 Open the properties for the Office program used to install Office 2007. 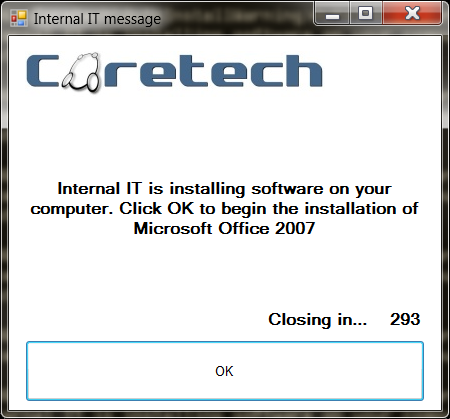 The message “Internal IT is installing software on your computer. 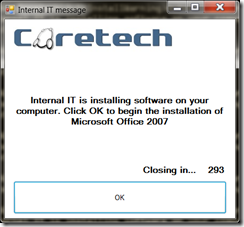 Click OK to begin the installation of Microsoft Office 2007” can it be changed to other languages as well ? Sure, you can customize everything. You can customize the text and the title. does it work on win 7 32/64 bit? I’m trying to use this in a task sequence for a complex software install. I have it set as the last step in the task sequence, and I see the AutoInstallWarning.exe running in Task Manager, but it’s apparently in the background, as I don’t see it. I seem to have this problem whenever I try to run stuff from task sequences, they run in the background. Any suggestions on how to get the AutoInstallWarning to run in the foreground when used with a task sequnce? Cd you pls advice how I can display bit more words (texts) to end users by using this utility. 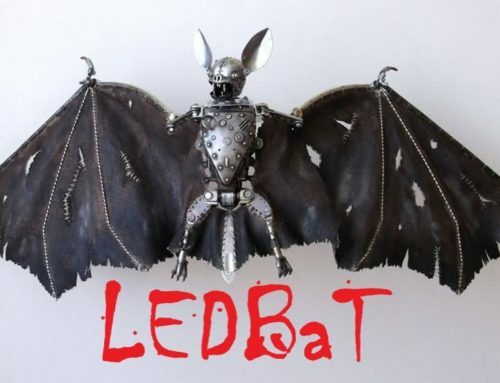 It’s awesome but it shows only limited no. of texts. After you asked your question i made a quick update for the utility, making the window bigger and option to resize text. having problems running this on x64 clients (path not found). Great app. Is it possible to disable any timeout so users are forced to acknowledge the message before the task is run? Is it possible to use your utility without configuration manager? I urgently need to find a good way to send messages to all pcs and your utility has a very nice interface. Yes you can use the tool outside ConfigMgr. When i try to use AutoinstallWarning i got an error “A failure exit code of 1 was returned. User context: NT AUTHORITYSYSTEM Possible cause: Systems Management Server (SMS) determines status for each program it executes. If SMS cannot find or correlate any installation status Management Information Format (MIF) files for the program, it uses the program’s exit code to determine status. An exit code of 1 is considered a failure. Solution: For more information on the exit code, refer to the documentation for the program you are distributing.” Where is mine mistake? Can you help me? is it possible to make the program wait until the user clicks Ok or should we just use a high enough counter to make sure the user will see it at some point? – I tried to set a large countdown period (>999 seconds) but the 4th digit seems to sit outside the border of the window, any chance of a fix for this at some point? When I deployed the package to our clients every single one sat at “Waiting for content” forever. After some research I discovered that by default request filtering in IIS7 will block .config files from being transferred to clients. I followed the steps here: http://myitforum.com/myitforumwp/2011/11/09/sccm-waiting-forever-for-content/ and it all started to work pretty much as soon as I saved the file. Apart from that, great program! Looking forward to using it in our environment. Great little app, can’t seem to customise the banner.jpg, is this by design? This is a great program I have 1 question and 1 idea for the next release (if your planing 1). How do I get my company banner or even the cortech banner to display neither seem to work. Is there a setting in the config file that I need to change? Giveing the client the ability to delay the install X amount of times before being forced. This utility is a great add-on for IT administration to get a message out before maintenence is done. Does not work with SCCM12 application deployment. There is no option to run a program first. hi. i want to know can i use it for software update? in face, before opening software update pop up, a custom notification appear for client. I know this may be an older thread, but you may be able to answer this. I am using this with ConfigMgr 2012. It took a while of trial and error to get it working but finally it is going. However, I cannot get the banner jpg to display when using it with ConfigMgr. Running the command locally from a cmd line and it works fine, but not when using the command programmatically via ConfigMgr. Any suggestions? I was able to make it work by changing the . designation for the root directory to the full absolute path. I ended up installing the app to C:Coretech rather than Program Files so as to not worry about the 32/64 bit program files folder names and then used the full path instead of . for the path to banner.jpg in the exe.config folder. Do you know what the message limit size is? Just curious. Thank you for suggesting the change path idea it was very helpful. 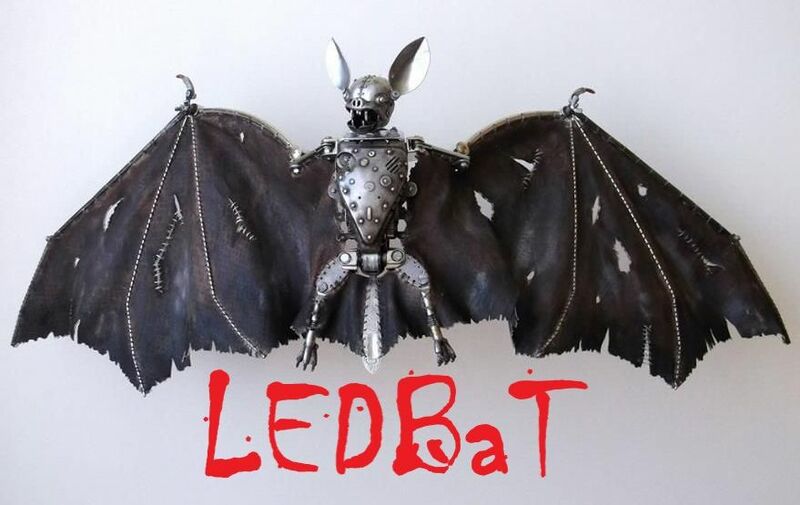 we are looking tto trade methods with others, please shoot me an e-mail iif interested. jobs:. In return you will get a product or trial for free. Thank you for the good work in providing this tool. Would it be possible to add a clickable link on the message. Is is possible to run a notification after the installation is complete? I have created a vbs but I am not sure how to have it run when the exit code is given. i have a package that have 4 programs which first uninstall software , reboot after uninstall , install software , reboot after install. am using Run another program first, i deployed all 4 programs to collection , scheduled uninstalled program to run from 7 PM. the other three to rum as soon as possible , hoping that they will only run after the first program has run at 7 PM, however thing did not work as i thought it will work , machines started rebooting during online day. question is , since uninstall software is scheduled to run at 7 PM and reboot after uninstalled scheduled to run as soon as possible, would this start the deployment earlier that 7 PM. Thanks for provide this utility. Trying to get it to work and have a few questions. – Do I need to deploy the “Message” package? 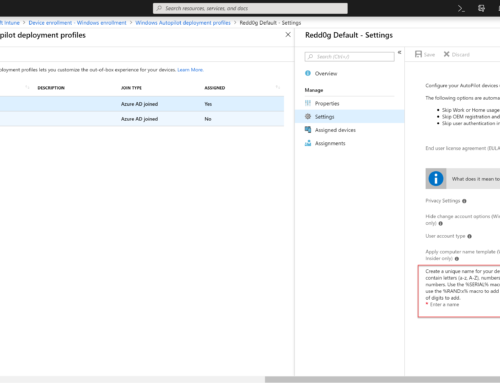 – Do I need to set “Allow user interaction” in both “Message” package and “Software A” package? – Can this work with mandatory/required deployments like Windows updates? – Can this work with Applications or just Packages? Just to say that I’ve got the first two points answered from testings. If you or anyone could shed some lights to the last two points, I’d really appreciate it. I can get the message to come up with using a command prompt, but when I try to run the script from a task sequence the message never comes up. any suggestions. I am trying to get this to work in my sccm environment and it will not popup the message. I am getting a error code 0x4005(16389) Unable to make changes to your software. please help! Is it possible to get the source files from “AutoInstallWarning.exe”? Very useful. Thanks for taking the time to make it.